Is to cultivate communication, awareness and friendships with the communities and individuals in the surrounding areas of Las Vegas. By providing knowledge and developing interest in Vintage Motorcycles built around the world since the early 19th century. This insight into the history and development of these two wheeled wonders will instill camaraderie between individuals and interest into owning, restoring and riding together as a group. 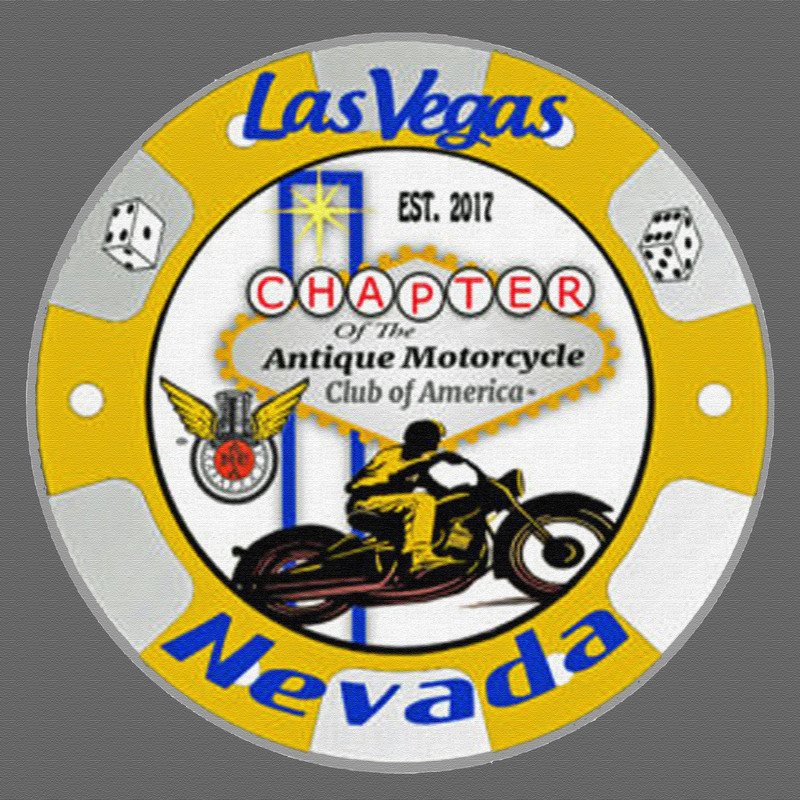 Began January 2017, when a bunch of vintage bike lovers all belonging to our parent organization of "The Antique Motorcycle Club of America" wanted to start a chapter here in Las Vegas. From that late day in January they were able to become the 75th Chapter of the AMCA by May 2017 and received our charter. Read the whole story in the Las Vegas Chapter history section. Our 4 Founding Board Members and 3 Executive Directors. Along with our other 27 Founding Members. Who put in long hours and their resources to bring this chapter to reality. 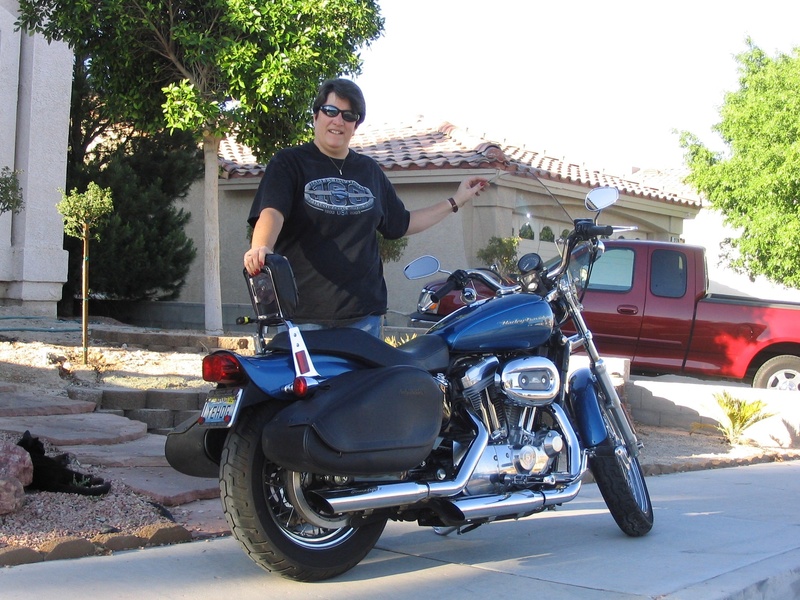 My motorcycle riding days started in my late teens while living on Long Island in New York. My younger bother is the one with the bike, I had cars. But on weekends I would take his Suzuki GT 380 and ride out to the Hamptons with friends cruising the beaches and in town. I really got hooked on the bikes in my Marine Corp years overseas and in Arizona. I have worked in dealerships in Japan and on the west coast over time. Owned a Kawasaki dealership in the 80's in California and a independent cycle shop in the early 90's. Did some road racing at Willow Springs and Riverside and tried doing some Speedway racing. Now-a-days I work on my bikes, ride and try to keep our club here moving in the right Direction. Hi, I am Coral Sue the secretary for the Las Vegas chapter of the AMCA. It was back in 2003 that I started riding street bikes, which hasn't been that long ago. When I was a young kid I did do some dirt bike riding though my younger years as I was growing up. But in 03 my husband Tim started riding street bikes again after the kids were grown and out of the house. Tim took me for a ride one day and I was hooked again. It was not long before I wanted my own bike to ride and we purchased at new HD Sportster 883 for me. To read more about me, please click the link below. Since I grew up in Orange county in Southern California. I started riding dirt bikes in the late 70's as my little brother was heavily interested in dirt bike riding at the time. When I married in the early 80's we were out at the Glamis Sand dunes at least once a month with our dirt bikes and ATV's. The kids loved the sport, which we continued doing over the years. I was really never into street bike riding until I met Rich my current husband. He has been involved with motorcycling for many years. I currently own a 2012 Yamaha Silverado S which we ride often along with our others. As you can see by my title above, i am currently the treasure of the club and have enjoyed meeting all of our club members. 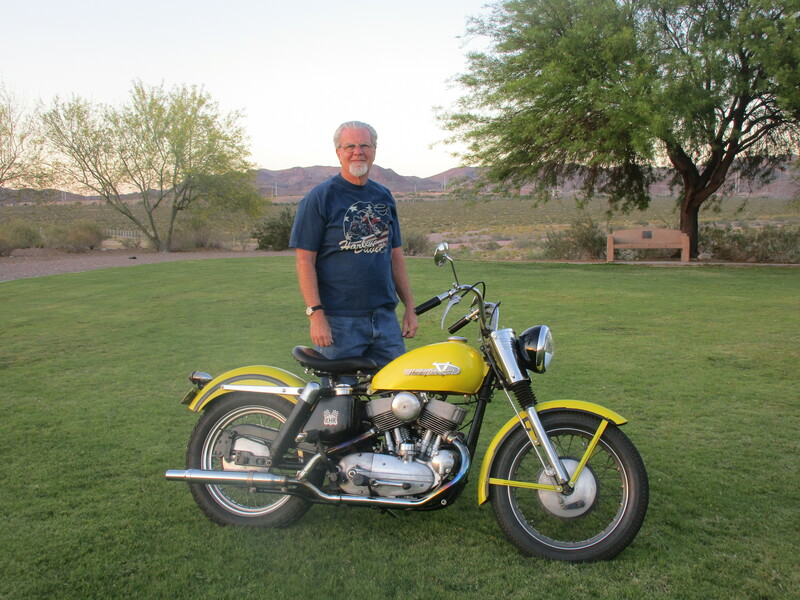 I bought my first bike in 1960. It was a Sears Twingle made by Puch - 125cc I think. Over the years I have owned numerous bikes, European, Japanese and American. About 25 years ago my wife, Clara and I bought our first antique bike, a ’49 Harley, on which we learned to do some mechanical and cosmetic restorations. Since then we have restored several more, all Harleys. We’ve done Panheads, a Flathead and a two stroke Harley Topper. 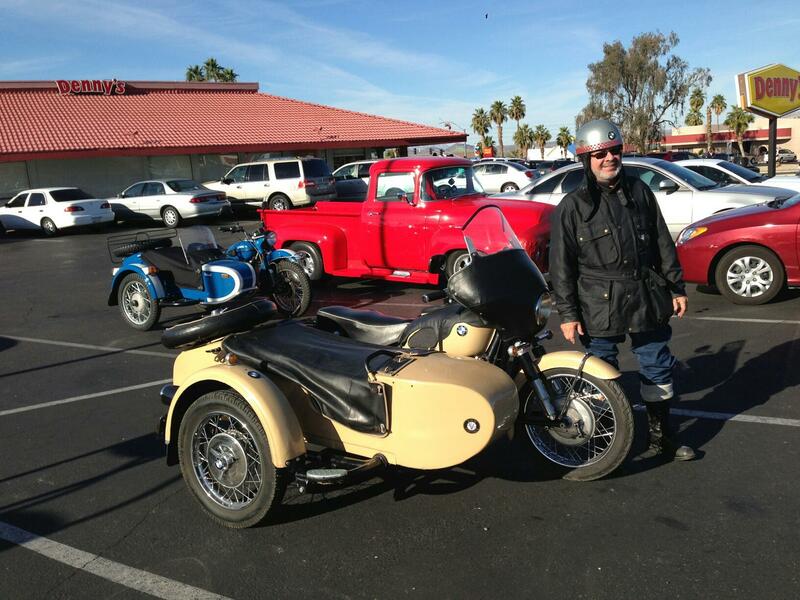 We try to attend as many antique bike events as we can every year, focusing on road runs and swap meets. We have followed along and helped the maintenance crews on all of the 4 Motorcycle Cannonball endurance runs, a coast to coast event for motorcycles 100 years old or older held every other year. My touring bike is an ‘03 Harley Road King and I sometimes pull an American Legend cargo trailer. The RK has 160,000+ miles on it. The trailer allows us to carry full camping gear and to stay out on the road for 4 or 5 weeks at a time. We typically ride 15,000 miles a year, to places like Daytona, Sturgis and Motor Maid events across the US and Canada. We’ve ridden as far south as Key West FL, and as far north as Fairbanks, AK. On the Alaskan trip, for example, we camped all but 3 nights in the 5 weeks that we travelled. I’m a member of the AMCA Las Vegas Chapter, AMA, The Moron Motorcycle Club and am a HOG life member. 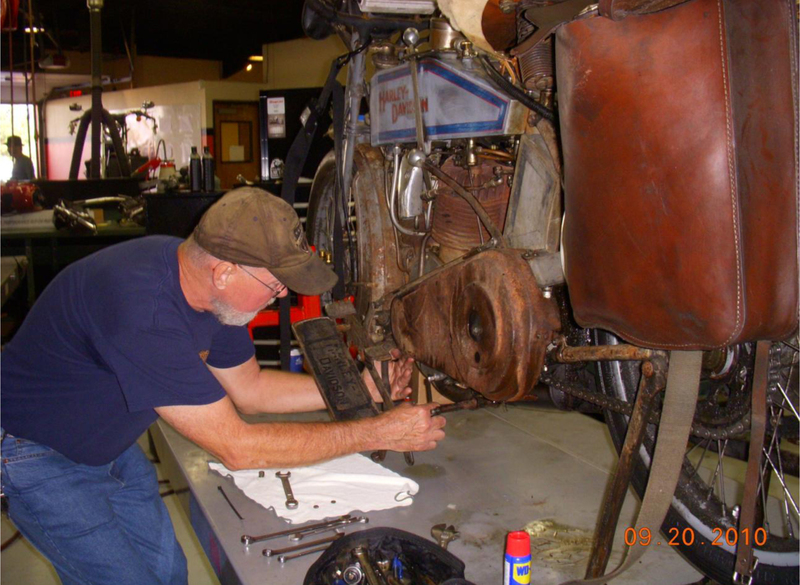 Throughout the years of motorcycle riding and wrenching, we have made many friends, famous and infamous! Since my retirement in 2005, I spend most of my time either riding or wrenching. Pigpen wrenches on Buzz Kantor’s 1915 Harley during the 2010 Motorcycle Cannonball. My riding days started back in 1950 some time, so that means have 58 years of being connected with these wonderful machines. Time just keeps moving faster and me slower, but I still enjoy riding the bikes that I have sitting in the garage. I have owned Vincent's, MV's, Ducati's and Moto Guzzie's along with Hondas and BMW's. My HD Trike is bike of choice now a days. Donna my wife enjoys riding with me, plus has put up with me and my many machines over the years. A good time for me is when I worked for the Guggenheim Museum as a consultant with the Art of the Motorcycle. Today I enjoy belonging to a number of motorcycle groups that keep me pretty busy. I'm Tim and I had my first ride on a bike in 1961. It was not a solo ride, I had my older brother behind me because it was on his Harley KR which he use to race. We lived in a very rural area of South Dakota so there was a lot of space to learn to ride. At first I had a hard time with the clutch lever, was hard to pull in so my brother helped me with that. Didn't take too long and I had the feel for the bike and didn't want to get off. Was able to do that a few more times but my parents moved us to Houston, Texas. and were against me riding bikes. a friend and I moved to Southern Cal. in 64. Were the two of us purchased a couple of 305 Yamaha scramblers. Wasn't long and was drafted into the Army, bought a 1952 K model in 71 for a $200 bucks which I had till 91 when I went through a divorce. After that I found a 1955 KHK in which I purchased and still ride today. I love the Las Vegas AMCA chapter. The people in it are all fun to be around, easy to talk to, and just good down to earth people. Plus, I get to drool over all their cool old bikes every time we have a gathering. You can read Tim's full Bio, By clicking below. Click that button to the right and be a part of us!! !